The print of this top immediately caught my eye; it's like nothing I've seen before. Though I wasn't sure if I would actually wear it, I knew right away that it would be mine. Beyond the colorful geisha motif, I (predictably) fell in love with the large bow. I wasn't entirely sure how to syle it, so I went with a simple, menswear-inspired look that had me feeling like quite the quirky dandy. the print on the blouse is too good. I'm telling you, I'm just 45minutes away and I want to shop with you. WOW, I want that blouse. What a great find and conversation piece! That shirt is amazing. And the jacket is really cute, too. I love the puffy shoulders. You look so adorable in this. What an amazing top! Love this outfit. What an incredible shirt. You find the best stuff! 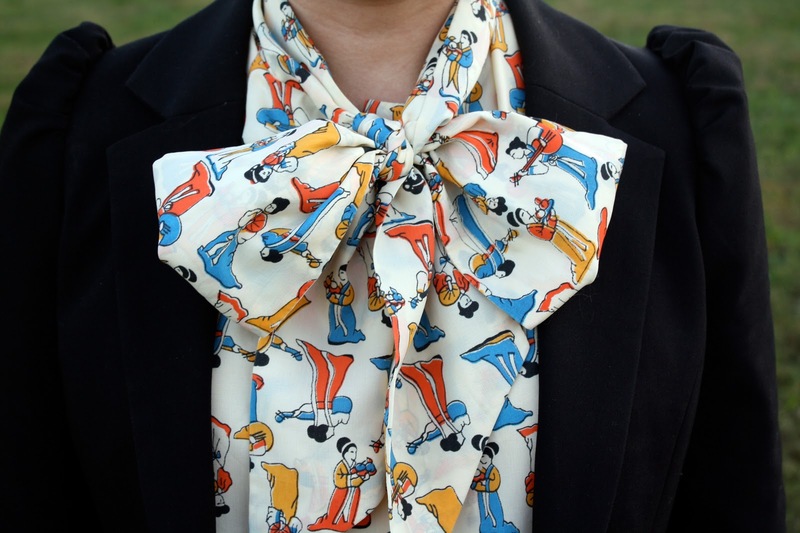 officially obsessed with your blouse. i'm the worst when it comes to experimenting with anything other than basic neutrals. (you'll rarely catch me in anything other than blacks, greys and navys.) anyway, i love the idea of mixing a bold, hyper-feminine print with an otherwise minimalist, menswear-inspired look. you look incredible! What a cute top!! I think it's an unspoken rule of all Salvation Armies that they MUST have at least one adorable, quirky-print top in their stores at all time! They always have the best things! Now that is a top that you definitely could not walk past. The shoes really make that outfit...so cute! And the blouse is amazing - definitely suits your style! 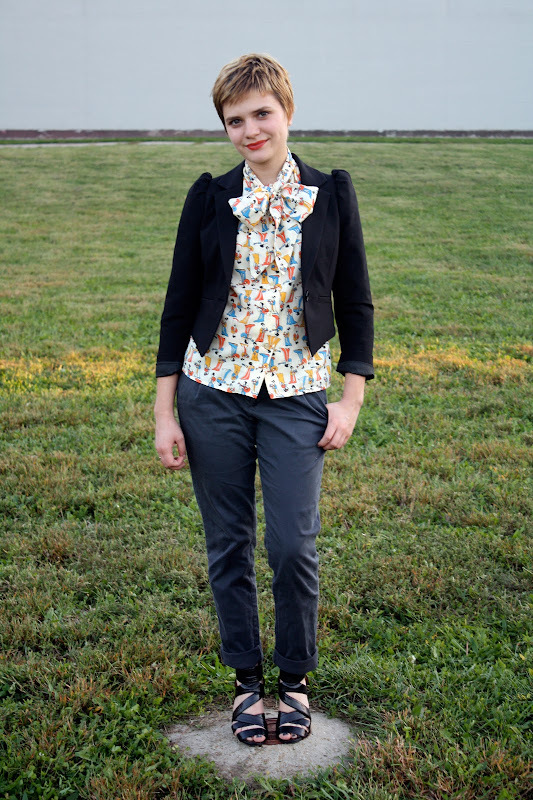 Love the blouse, looks great with the pants and the blazer! Cute styling! very unique. i love that! That blouse is too cute! Loving those shoes!! Christian was my all time favorite project runway winner...he is so fun to watch and deserves the fame..Love! thanks for keeping it real..love your blog. how do you find the best things , its amazing! you have the best thrift stores!! What a gorgeous printed top! I love it. Those shoes are great as well-- I love the criss-crossing straps. the print on your top is adorable!!!! Pairing it with all those dark colors makes it stand out,amazing outfit!!!! You always wear the cutest shirts!! This outfit is adorable. This shirt is the best! I love that blouse! I am a big fan of novelty prints, and I love when you can only tell that the design is something other than floral or abstract when you see the print up close. When I visit my grandparents in Kansas I always enjoy hitting second hand shops- I remember being genuinely surprised by how bold and stylish some of the pieces were. Who would have thought mid western women would be so hip? oh my gosh. that blouse...amazing.